In this article, we are going to understand attributes associated with the current request made by the user. A request attribute is an object added to the request scope on the server side used for the request processing. We can set and get the value of attributes associated with the request by using the methods of ServletRequest object. After setting some attributes with the current request, we can even pass this request from one to another Servlet in order to have a shared request processing by multiple Servlets. Object getAttribute(String str) This method gets an individual request attributes. Enumeration getAttributesNames() This method gets all the named of request attributes. void setAttribute(String name, Object value) This method sets the request attributes. void removeAttribute(String name) This method sets the request attributes. after filling the details when submit button is clicked, the request is are dispatched or forwarded to the Servlet named FirstServlet (mentioned in the deployment descriptor file(web.xml). We are creating a Servlet extending GenericServlet abstract class. GenericServlet class implements Servlet and ServletConfig interface, hence we can directly call the methods of ServletConfig within this Servlet. In this Servlet class named MyServlet1.java, we have implemented the service(ServletRequest req, ServletResponse res) of GenericServlet. Within the service() method, by using the object of ServletRequest we have created two request attributes named Name and Salary and have set them in the current request using the method setAttribute() method of ServletRequest. Next, by using the request object we have called its method getRequestDispatcher(String path) method to create an object of RequestDispatcher. Project Folder - We have created a project folder named Attributes within the webapps folder of Tomcat installation folder. This folder contains the Servlet class(.java) file and WEB-INF folder. 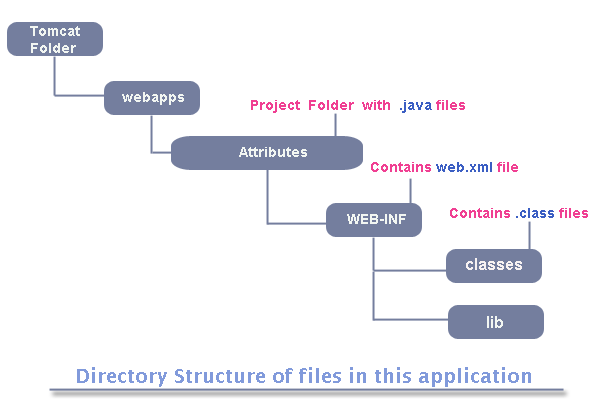 WEB-INF - Within your project folder, you create another folder named WEB-INF and this folder should contain the deployment descriptor file(web.xml) of your Java Servlet program. classes - Within the WEB-INF folder you should create a folder named classes. This folder should contain the compiled(.class) form of your Java Servlet class. <servlet-name> tag is used to specify a unique name for our Servlet class. <servlet-class> tag is used to specify the full qualified name of the Servlet class . We have named this URL SecondServlet to access the second servlet, MyServlet2.java. We have named this URL ThirdServlet to access the third servlet, MyServlet3.java. Much of the support for developing the web applications based on the Java Servlet technology does not come with the core Java. Hence, in order to compile the Servlet programs, we have to set the classpath to a jar file named servlet-api.jar. This jar file provides all the classes that are required for the Servlet programming and it comes within the lib Folder of Tomcat installation folder. You could set the classpath by entering this command at the Command Prompt, but this only temporarily sets the classpath to the path of servlet-api.jar file. If you restart your system, you will have to set the classpath again. After setting the classpath, you need to compile the both of the Servlet class by entering the command at the folder where you've stored the Servlet class file. First we execute the webpage containing the form, asking the user to and press the submit button, if he/she wants to forward the current request from the first servlet to the second servlet. Although this webpage calls the first servlet but this first Servlet immediately calls the second servlet due to a call to RequestDispatcher's forward() method. if you are eligible, then the current request and its attributes are forwarded to the third servlet named ThirdServlet, and an appropriate congratulatory message which also includes the form webpage by calling include() method of RequestDispatcher.